Has everyone else seen the fabulous cover Dark Faerie Tales has uncovered for Jackie Morse Kessler’s Hunger? This is the first novel in her Horsemen of the Apocalypse young adult series which comes out October 18, 2010. This is a fabulous cover and I would just love to have it in a poster size for my kitchen (where else would I put Hunger?). Suvudu has posted an excerpt for China Mieville’s Kraken. Orbit has also posted the first chapter to Jaye Well’s The Mage in Black and the first chapter to Gail Carriger’s Changeless. Voyager Online is showing off Stacia Kane’s Unholy Ghosts by posting the first chapter. 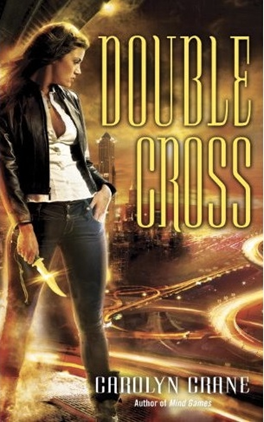 There are a ton of covers that were unveiled this past weekend (to see them all, click here), but I had to show off Carolyn Crane’s Double Cross, which is the second novel in the Disillusionists series. It’s another great cover and the first novel, Mind Games, was just released. Double Cross will be released September 28, 2010. Melissa Marr has posted a bunch of links to where you can find the second part to her story Stopping Time. Dark Faerie Tales has posted her guidelines for the new Debut Paranormal Romance Challenge. This is another great challenge that goes well with my own New Author Challenge, so make sure you head over and check it out. I’ll be joining and will be posting my official announcement soon. SciFiGuy has another fabulous Weekend Report for your reading pleasure. Wicked Little Pixie is giving away a copy of Patricia Brigg’s Silver Borne. Contest ends March 29th. Gena Showalter is giving away an ARC of her upcoming novel, The Darkest Passion. Contest ends soon. Patricia’s Vampire Notes is giving away a copy of Stacia Kane’s Demon Possessed. Contest ends April 9th. I don’t know about anyone else, but these behind the scenes sneak peek at Eclipse makes it look like it’s going to be way more fabulous than either Twilight or New Moon. The cover looks fabulous as a poster, doesn’t it. :P I knew it.